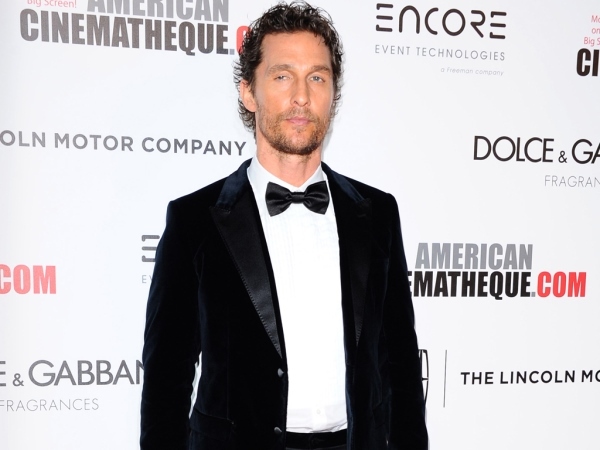 Matthew McConaughey: Camila's my dream girl! Matthew McConaughey was always convinced his wife was The One. The hunky Hollywood star has enjoyed one of the most successful years of his career, winning an Oscar and a Golden Globe for his portrayal of real life AIDS patient Ron Woodroof in Dallas Buyers Club. His personal life is also pretty rosy, and he and wife Camila Alves celebrated two years of marriage in June. They are also proud parents to Livingston, Levi and Vida. In a recent feature for American GQ magazine, Matthew revealed it took a little convincing from Camila to walk down the aisle, but he says that's not what he meant. "I was always convinced [she was The One] – it was about the timing question, for me, and like I said in the article, really wanting to wake up and feeling like, 'Boy, I so look forward to this, I have to and here's why'. And I got the nudge from Camilla," he explained to Access Hollywood. "It was a push that turned into a dance, but it had enough aggression behind it to be, to be heard!" As well as his movie accolades, the 44-year-old also wowed TV audiences and critics with smash hit show True Detective. He is now back to his film roots, with new flick Interstellar due to hit cinema screens next month. Directed by Christopher Nolan, the sci-fi tale is about a group of explorers who manage to expand the limitations of human space travel. "The challenge was the early work before, in pre-production, to understand the meaning behind the lingo, so you know what the hell you're saying, or what you're talking about," Matthew smiled. "Physically, it was more of an endurance. It was a long shoot – five months – we went many places. There was a lot of natural elements that were just there and that were very tough. Great thing about working on a Christopher Nolan film is you're not acting to a green screen, you're not acting to fake dust… he's building it. So you get to work around in it."